Offering you a complete choice of products which include trim seal butterfly valves, carbon steel ball valves, weir type diaphragm valves, diverter gate valve, slide gates and flap valves / cone valves. Since our inception, we are instrumental in offering premium quality Trim Seal Butterfly Valves. These butterfly valves absorb side loads applied to the disc by the flowing media. Our butterfly valves are manufactured in compliance with set industry norms & advance technology. 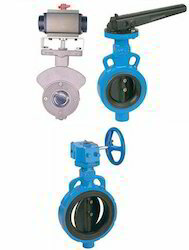 We offer these butterfly valves from us within a given time frame at reasonable rates. 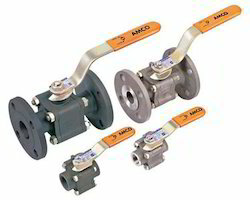 Carbon Steel Ball Valves are Manufactured with Full Port/Regular Port constructions. Where the application requires minimal pressure drop, the user is advised to opt for Full port construction. When a Ball Valve is chosen to replace a Gate Valve, the obvious choice is a Full Port Ball Valve. But when pressure drops are acceptable or if regulating valves such as globe valves are replaced on the line with Ball valves, Regular Port Design would be quite adequate. Full port and Regular Port Ball valves, are identical to each other with regards to the dimensions. To keep the client satisfied, we distribute, trade, & supply high quality Weir Type Diaphragm Valves. These diaphragm valves are tested in terms of quality so as to deliver a defect free range. Our offered diaphragm valves are manufactured using top notched material and the advance technology in accordance with industry standards. The diaphragm valves offered by us are provided in various specifications as per the need of customers. MAXIMIUS manufactures & supplies these fabricated valves as per customers' requirements. · Economical, robust and reliable solution for bulk material. · Fabricated construction available in MS and SS Materials. · Choice of multiple options of operation - Manual, Pneumatic and Motorized actuation. MAXIMIUS Slide Gate Valves are designed to provide a quick acting isolation valve unit that can be installed into a bulk handling flow path to stop material flow.MAXIMIUS Slide gate valves are simple and compact in design, robust in structure, excellent in technology and are easy to install. Slide gate valves are designed to shut off product flow from outlets of storage bins, silos, conveyors, and other discharge points handling dry bulk materials. Flexible Design Customized to Fit Most Project Applications. Stainless steel and aluminum construction provides virtually limitless design flexibility. 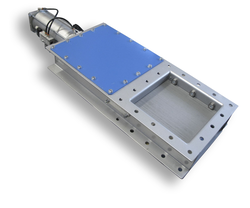 Double Cone / Flap valves are used for controlled feeding as well as achieving air lock sealing. These valves consist of two independent Cones / Flap valves mounted one upon other with their opening and closing alternated and synchronized to ensure that only one valve opens at a time. MAXIMIUS manufacture these valves to suit the opening sizes and required through-put rate. The through-put of these valves depend on the holding volume of the upper valve chamber and the rate of operations. These are very slow operating valves as the operation cycle rate does not usually exceed beyond 6 cycles per minutes. Thus these valves have a batch feeding pattern rather than continuous feeding. 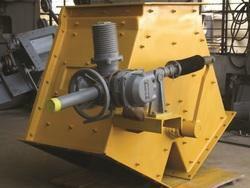 A centrifugal discharge elevator may be vertical or inclined. Vertical elevators depend entirely on the action of centrifugal force to get the material into the discharge chute and must be run at speeds relatively high. Inclined elevators with buckets spaced apart or set close together may have the discharge chute set partly under the head pulley. 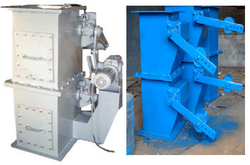 1) Centrifugal Discharge Elevator - The elevator buckets discharge product freely by the use of centrifugal force. Product flings out of the bucket into the discharge spout located at the top of the elevator. The most common style elevator bucket seen in agricultural application is the "CC" style. 2) Continuous Discharge Elevator- This style bucket elevator is used typically to discharge sluggish and non free flowing product where the elevator buckets discharge on top of each other. Speeds are run in the 125 fpm range to accomplish this type of centrifugal force. Common styles of elevator buckets seen in this application would be the MF, HF, LF, and HFO due tot their "V" style among other attributes. 3) Positive Discharge Elevator – Elevator design where the buckets are used to elevate commodities such as SLURRY MATERIAL. To discharge the bucket it's mechanically tripped to flip and discharge but until this action the bucket is held parallel with the floor and upright. These elevators typically form an "S" or "L" in design and run throughout a plant. 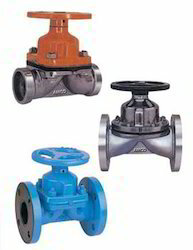 As per the variegated requirements of our clients, we are offering a broad collection of Knife Edge Gate Valves. Widely use in power plants, steel plants, cement plants, these gate valves are manufactured by making use of finest quality basic material and advance technology in adherence to set market parameters. 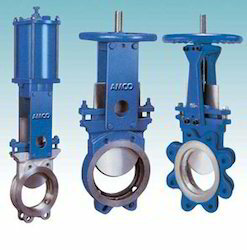 Our offered gate valves are available in various specifications in order to fulfill the various needs of the customers.